Three weeks from today, I will be in Munich, Germany! I am so excited that I am reading my Rick Steves Travel Guides from cover to cover. After Munich we will spend a night in Verona, Italy, a night in Florence and then we move on to Rome. Then a loooong flight back to Sacramento and our first trip to Europe will be behind us. I am hoping to stop by some of Rachael's picks for Rome. The Food Network aired a $40 a Day marathon and some of her picks there look wonderful. I promise to report back. If you are interested in learning more about my trip or just like reading about travel stuff, you can check out Dream Vacation Game, which I write whenever I feel like it (so it's not regularly updated). Here's the Rachael Ray posts I found around the Blogosphere this week that I thought you might find interesting. 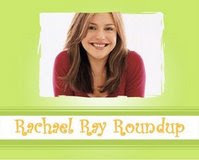 If you write a post about Rachael Ray or see one that you think would be perfect for the Roundup, please email me! Talk Show Ratings Update: It was another record-breaking week for Rachael Ray's talk show. Broadcasting & Cable says: "Rookie Rachael Ray had its best week ever with a 2.6 average." Paula, The Cookbook Junkie, tried a recipe for Chicken, Veal or Pork Schnitzel with Red Caraway Cabbage from 365: No Repeats. She went with the pork and it was a success, although she wasn't wild about the cabbage. Jacob at Food Network Addict has some pictures of Rachael Ray from her hosting gig at the Burger Bash that opened the South Beach Wine and Food Festival. Man, I am so jealous that he got to go! In fact, he has a ton of pictures from the whole event, so go check them out. Bob Sassone at Slashfood gives a rundown of the highlights from this March's issue of Every Day with Rachael Ray. Cate at Sweetnicks refers to Rachael's Express Lane Meals list of things to keep in your pantry for her quick refresher course on how to keep your kitchen stocked. You can also check out the Every Day Kitchen list from Rachael's magazine. Celebrity Mound has some pictures of Rachael at the William Morris party at Hotel Victor during the South Beach Wine and Food Festival. Who knew Rachael was a DJ? Kris D'Arcy at You Are What You Eat tried Rachael's Asparagus Pasta Salad for a party. This is my go-to dish for baby showers, wedding showers, and just about any kind of party. And there's no mayo in it! Tracey at Foodie Obsessed likes the Heat n' Eat concept, too. Now somebody go try it! Rachel at Rachel's Bite tried Sliced Tuna Soft Tacos from the March issue of Every Day with Rachael Ray. Coaster Punchman is glad that his girlfriend Rachael finally discovered Mike's Donuts in Brooklyn. It will be featured this week on Rachael Ray's talk show. Mo H of the Wet Noodle Posse Blog impressed at least some of her family when she got herself out of a cooking rut and tried a Rachael Ray recipe. Check out how Diana at Celiac Food Reviews loved converted Rachael's Proscuitto and Spinach Bucatini into a gluten free meal that was a hit. Lindsey Russell discusses life lessons you can learn from Rachael Ray. How fun! I'm supposed to be going to Munich this year, too, with my grandfather(his hometown) and Dad. We'll see if it really happens. Florence is beautiful and I really enjoyed Rome (go eat at Carlo Menta). I got my Eurail tickets in the mail today - it finally seems real that we are going.